HAPPY FRIDAY!!! Another week in the books – most of the week it’s been too hot to cut the grass and now I’m staring at a downpour out of my office window – gotta love Ohio weather!! In my last post, I gave a brief outline of several strategies I implement for my group clients that help them save money on their insurance premiums without skimping on the benefits to their employees. As promised, I’m going to dive into each strategy to help explain it in a little more detail. In my opinion, this is the easiest of the strategies to implement and maintain. The strategy is all in the name – instead of offering one plan choice to your employees, you offer 2….or 3…etc… There’s not much to explain to your employees, and when you do explain it to them, most of the time they actually pretty happy about it. Why are they happy? One word – CHOICE!! Think about it – we’re a society built around consumerism – we have choices in every aspect of our lives…..who we get a mortgage through, which store to buy groceries from, where to buy our clothes, who our cell phone carrier is….the list goes on and on. So, when it comes to purchasing the health insurance plan that works best for us and our families ( both in premium and coverage levels ) we want a choice in the matter. This strategy works really well because not only does each employee want a choice, but each of them have different needs – actual medical need, salary amount, and size of the family they’re covering, just to name a few things they’re taking into consideration. 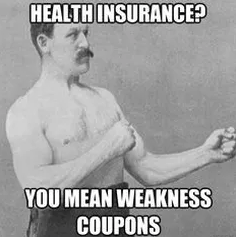 A 50 year old employee with a wife and a couple kids is going to want a plan that has a low to mid-range deductible with office visit, emergency room, urgent care and prescription drug co-pays because they know that the kids are going to use the co-pay benefits a lot, and he or she may have some health issues that may hit their deductible level this year or next and they don’t want to pay a ton out of pocket in case they need to have that outpatient surgery they’ve been trying to put off. They can pay a little more for this better plan because they’ve been working for you for the last 15 years and are making a decent salary to support their family. On the other side of the fence, you recently just hired a 23 year old fresh out of college that is showing a ton of promise and is a really hard worker. He’s not married and has no kids….or worries in the world other than his college debt at this point – haha! What else doesn’t he have??? A lot of money or health conditions – in the industry, he’s what we refer to as a “Young Invincible”. He’ll rarely go to the doctor, other than his yearly physical ( covered at 100% ), and doesn’t take any meds. He needs a super high deductible plan to offset anything catastrophic that would happen to him simply because it won’t cost as much as the mid to low deductible plan will….he doesn’t need the better insurance, so why pay for it? The strategy is simple – instead of offering a “One Size Fits All” plan to your employees, offer 2 plans. One plan could be a $1,000 deductible plan that has a $20 office visit co-pay and a $10/$35/$60 Prescription drug card. The other plan could be a $4,000 deductible HSA plan and let your employees choose. In the past most insurance carriers wanted you to have 10 or more employees on your health plan before they allowed you to offer more than one plan – while some are still operating this way, there are 2 very major players in the market that will allow you to do this with only 2 employees on the plan – essentially one plan for each!! Now, as an employer, you may be thinking, “Joe, this strategy sounds great, but I can’t afford to pay a portion of the $1,000 plan you were talking about…” Very, Very valid concern. Here’s my response – as an employer you don’t have to pay your contribution based on the $1,000 deductible plan! In a group based plan, the insurance carriers tell you that you have to pay a minimum of 50% of the Employee Only rate. You can simply pay 50%, 60%, 75% ( or whatever % ), or a defined $$ amount, for the LOW COSTING PLAN and use that as your contribution level. Employees that choose the lower costing plan will pay less for their plan. Employees that choose the better benefits can simply “BUY-UP” to the higher costing plan and will pay a little more for better coverage. Simple concept incorporating this “defined contribution” method into a dual option strategy. I hope you’ve found this information helpful! If you have any questions, always feel free to email or call. Thank for reading!! Have a great weekend and Go Bucks!!! !